Amazon Echo, a cylindrical Bluetooth speaker that doubles as a semi-assistant for your home, is on sale for today only at $149.99. That’s a $30 discount, in case you were wondering. 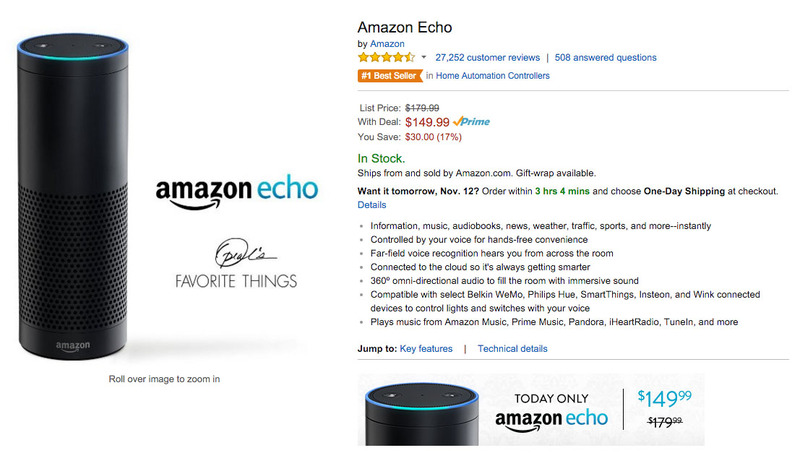 Not familiar with Amazon Echo? It’s actually pretty cool. I have one in my kitchen, as does my brother. We both use ours to play music by using voice commands (like “Hey, Alexa, play 90s hip hop.”), ask it for answers to questions we may be having during a conversations, and set timers while cooking this or that. It really is a highly useful tool that can also take care of your media needs when in a pinch. It does much more than those few things, though. By triggering it with a “Hey, Alexa” command (Why it isn’t “Hey, Echo” is beyond me. ), you can also ask it for weather, news, traffic, and sports scores. You can also connect to services like Pandora or iHeartRadio, Philips Hue, SmartThings, and you Google Calendar. You can even shop, by asking it to re-order Prime-eligible products. Again, it’s $30 off, today only.